^ 1.0 1.1 1.2 1.3 PHILAE. National Space Science Data Center. [28 January 2014]. ^ No. 2 – Activating Rosetta. European Space Agency. 8 March 2004 [8 January 2014]. ^ S. Ulamec, S. Espinasse, B. Feuerbacher, M. Hilchenbach, D. Moura, H. Rosenbauer, H. Scheuerle, R. Willnecker. Rosetta Lander—Philae: Implications of an alternative mission. Acta Astronautica. 2006, 58 (8): 435–441. Bibcode:2006AcAau..58..435U. doi:10.1016/j.actaastro.2005.12.009. ^ J. Biele. The Experiments Onboard the ROSETTA Lander. Journal Earth, Moon, and Planets. 2002, 90 (1–4): 445–458. Bibcode:2002EM&P...90..445B. doi:10.1023/A:1021523227314. ^ Agle, DC; Cook, Jia-Rui; Brown, Dwayne; Bauer, Markus. NASA Release = 2014-015 - Rosetta: To Chase a Comet. NASA. 17 January 2014 [18 January 2014]. ^ Europe's Comet Chaser - Historic mission. European Space Agency. 16 January 2014 [5 August 2014]. ^ ESOC at ESA website, retrieved 13 November 2014. ^ Bauer, Markus. 'J' Marks the Spot for Rosetta's Lander. European Space Agency. 15 September 2014 [20 September 2014]. ^ Kramer, Miriam. Historic Comet Landing Site Has a New Name: Agilkia. Space.com. 5 November 2014 [5 November 2014]. ^ Will Philae successfully land on comet? Thruster trouble heightens drama.. Christian Science Monitor. 12 November 2014. ^ Rosetta and Philae go for separation. Rosetta Blog (ESA). 12 November 2014. 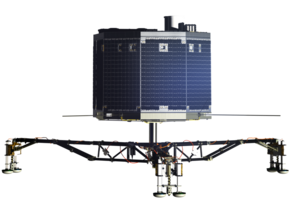 ^ Rosetta to Deploy Lander on 12 November. European Space Agency. 26 September 2014 [4 October 2014]. ^ Platt, Jane. Rosetta Races Toward Comet Touchdown. NASA. 6 November 2014 [7 November 2014]. ^ Probe makes historic comet landing. BBC News. [12 November 2014]. ^ Scientists 'confident' comet lander will wake up. Yahoo News. [November 18, 2014]. ^ Rosetta's lander Philae wakes up from hibernation. European Space Agency, Rosetta Blog. 14 June 2015 [14 June 2015]. ^ Biever, Celeste; Gibney, Elizabeth. Philae comet lander wakes up and phones home. Nature (journal). 14 June 2015 [14 June 2015]. doi:10.1038/nature.2015.17756.